MQTT stands for “Message Queue Telemetry Transport” and is an in 1999 finally created/authored very simple protocol to transport data between several clients in a TCP/IP network in all formats (like, text, numbers, hex, Base64, etc.) by using only a minimum of data to save expensive network bandwidth and keep battery drain as low as possible. MQTT is today used a lot for M2M communication in the IoT. Each client connects to a broker, which is acting as a server, and can then post (publish) data towards a specific topic. All other clients can subscribe to such a topic or also more topics or wildcard-named topics to receive information. The broker usually runs on port 1883. The simple initial startup is usually sufficient for first tests in a local environment like the private home network. A topic specifies a filterset, to specify which data to subscribe to when reading and which value when sending. When sending the topic has to be exact as it can be seen in the examples below, but when reading from it, the description can be chosen so just select a set of data. 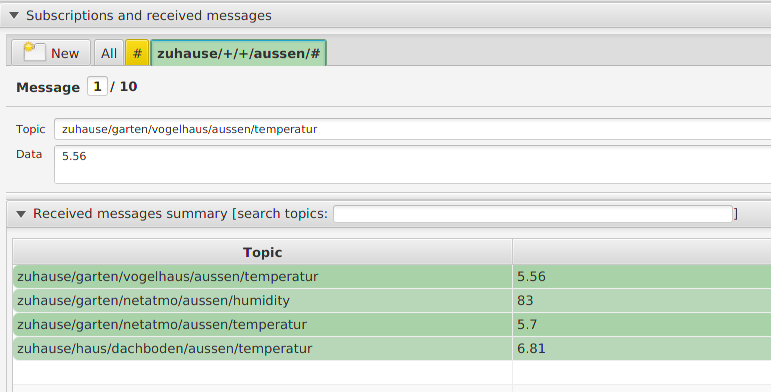 The characters '#' is used for wildcard-topics between slashes and '+' is used for sections. So the following subscription wants to grab all out-door values ('aussen') from all devices of my home ('zuhause'). Remind, topics are case sensitive. With useful filterings when asigning to topics and a well thought structure in the environment, data can be grabbed afterwards in useful filtered groups. If everything shall be monitored, there is only a subscribtion to topic '#' neccessary. echo "ERROR: Watchdog timeout reached, mosquitto broker seems to be down or damaged." echo "ERROR: An unexpected error occurred with Code $STATUS"
#    echo "$(date) -> Broker is still alive, everything is fine. :-)"